There comes a moment in a mother’s life when the question in her heart of whether she’ll have another baby is silenced. A point when she knows, truly knows, that the days of rubbing her pregnant belly and sniffing the head of her newborn are behind her. A time when there is neither hesitation before her reply nor waivering in her voice when she answers the ‘another baby’ question. She just knows. After months of sleepless nights as I tossed and turned over this question, my day came. I just knew, it is time to close the door on the baby part of my parenting journey. It would be nice if leaving the baby phase behind was as simple as closing a door but unfortunately it’s not. Reaching this point means dealing with the furniture, clothes and toys held onto just in case there would be another baby. How do we choose the pieces that will make it to that keep pile? Baby’s first outfit, baby’s first shoes and the christening gown are all obvious choices to be keepsakes. But are these the pieces that carry the most memories? I remember tying the bow on Mr Tiny’s first outfit so many times that the end frayed yet there are precious memories in other pieces that weren’t the first outfit. The first teeny swimmers Mr Little ever owned. Mr Tiny’s first shoes when he started walking. The gown Littlest was wearing in hospital after his first ever bath. The helmet Littlest wore from four months old. 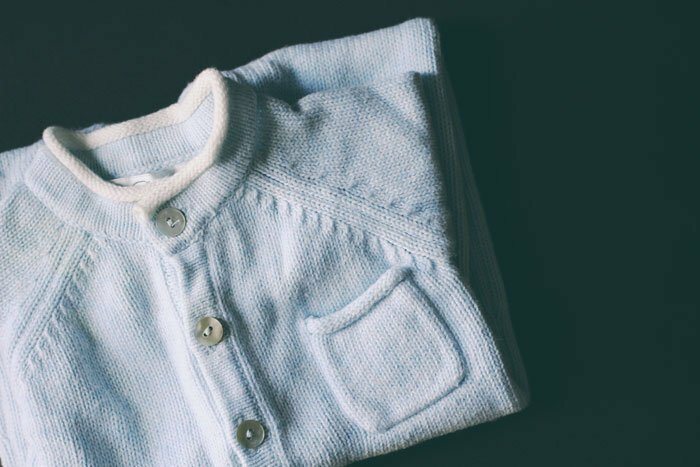 The little blue cardigan and singlet rompers that Mr Tiny, Mr Little and Littlest all wore. As I picked up each piece of clothing, our past would rush over me. There were recollections that made me laugh and memories that made me cry. There were stories I want to tell my children when they grow up and moments I will never forget. And they were all embedded in the threads of the delicate, little pieces of clothing I held in my hands. Remarkably as the sun set and the boxes were taped closed for their extended storage, there were only two marked keep. The babyhood of three little boys wrapped up in two little boxes. I wondered how a babyhood filled with memories so big can be wrapped up in boxes so small. But only for a minute, because I know that what matters most are the memories we store in our hearts. By letting go of the clothing, I don’t lose the memories of their babyhood, but by freeing my heart from what might have been if I had another baby I gain more space in it to enjoy what we have now. Do you have clothing from your little one’s infancy stored away too?